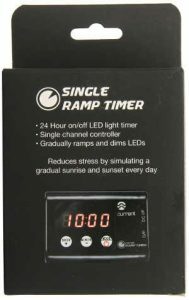 The Current USA Single Ramp Timer is used to slowly adjust the aquarium lighting either on or off. These changes happen over 15 minutes giving our fish the chance to seek shelter at night or wake up and swim around in the morning. This is a much more suitable way to deal with our aquarium lighting rather than simply flipping the lights off suddenly. So what exactly makes this timer worth the investment? A good question an aquarist should ask about any piece of equipment before purchase. Overall the timer meets exactly what most users are looking for in an aquarium light timer. It will slowly change the lighting based on your programmed time. As previously stated the Current USA Timer is easy to set up. First unplug your current light fixture at the source of power. Next take the male DC plug and connect it to your light/lights. Splitters can be used as long as they do not exceed 84 watts at 24VDC or 42 watts at 12VDC total. Next take the Female DC Plug and connect it to the lights power source using the lights cord. This completes the circuit and should power both your lights and the timer. Make sure the power is on for both of these before moving on. With a little research into our fish we can determine the amount of light they are most comfortable with. Using that information the timer can be set to give us optimal fish viewing time along with keeping the fish themselves happy. Personally before I used a timer I often forgot to turn off the lights at night or would forget to turn them back on before leaving the house. Ever since installing the timer my fish seem more calm and my corals have seen improved growth.In fact my little two headed hammer coral now spans enough for my clowns to host them. To set the on and off times you must press mode a single time to change to timer mode. From here you use the hour+ and minute- buttons to set the time. Press the mode button again to confirm the time and move on to the on time setting. Here you will also use the hour+ and minute- buttons. Once your press mode again the time will be saved and that will be the time when your lights are set to turn on. Now the off display will show and you will follow the same method for setting the timer. Finally the aquarium light timer will flash either F1 or F2. F1 is the setting that ramps up/down when the lights are set to turn on/off. F2 will instantly turn the lights on or off. Naturally I suggest using the F1 setting as this gives your fish the best morning and night experiences. Press the hour+ and minute- buttons to choose between the two and hit the mode button one last time. This completes your programming. While a small feature this still needs it’s own section. The manual on off feature can be used whenever the owner likes Via the hour+ button. This turns the light on and off and breaks the cycle of the light timer. Should you wish to return to the light cycle simply hit the mode button once and the cycle will resume as normal. Remember that the timer is not water proof. With this in mind a drip loop before the timer may be needed. It is actually safest to create drip loops on both sides of the timer, as you will need to protect both the timer and the power outlet from any dripping water. The light is provided a 30 day warranty via Amazon and a 1 year warranty after that by Current USA. If the timer breaks within Amazons warrant I highly advise you use their warranty. They are quick and ask no questions. Manufacturers will fix/replace the timer but it will take a little longer. This entry was posted in Equipment on May 7, 2018 by Joshua@themandaringarden.